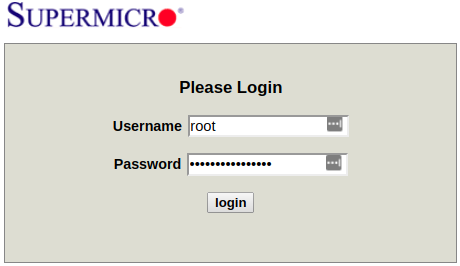 Depending on the manufacturer of your Dedicated server hardware and motherboard, you will have Supermicro Intelligent Platform Management Interface (IPMI) or Dell Remote Access Controller (iDRAC) to manage and monitor the server. Both IPMI and iDRAC are accessible from our private network (VPN) only. All necessary instructions on how to setup a VPN connection to access the IPMI interface are here. In a web browser, type the 198.18.19.20 IP address, and log in using the IPMI access credentials from your Welcome email. 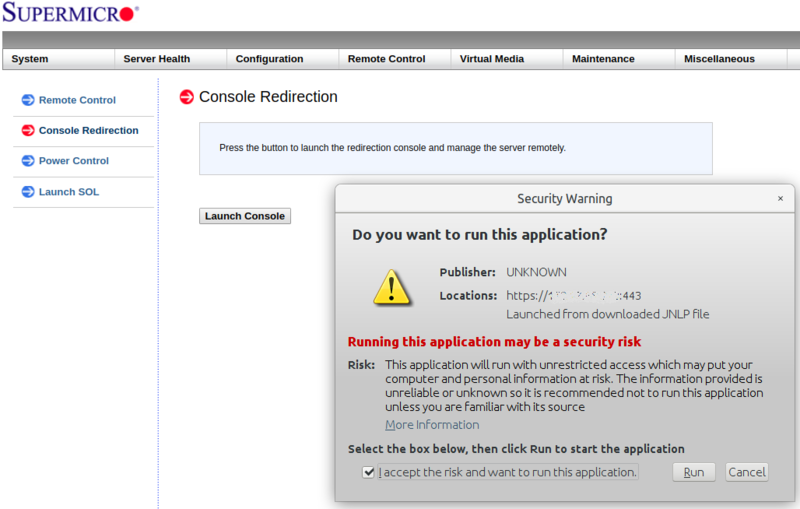 Click on a black screen inside the Remote console preview area, or navigate to the upper menu: Remote Control >> Console redirection and click the Launch Console button. A launch.jnlp file will be downloaded to your workstation. 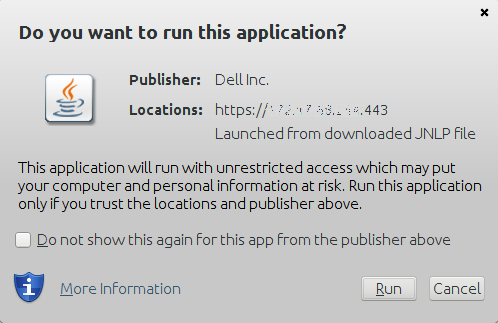 Open it when the download has finished, check the I accept the risk and want to run this application checkbox and hit Run. 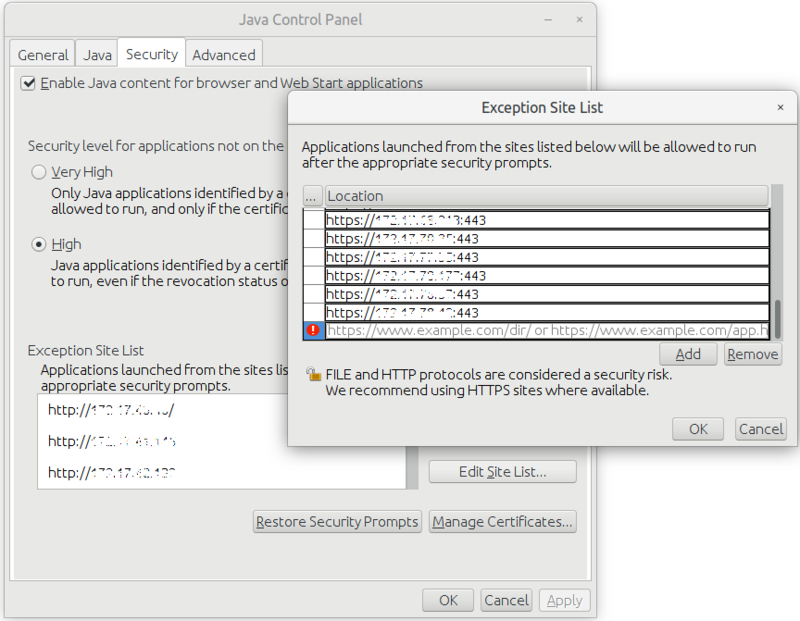 You'll need to configure your Exception Site List and Security levels through the Java Control Panel. Then, you should be able to launch Virtual Console. 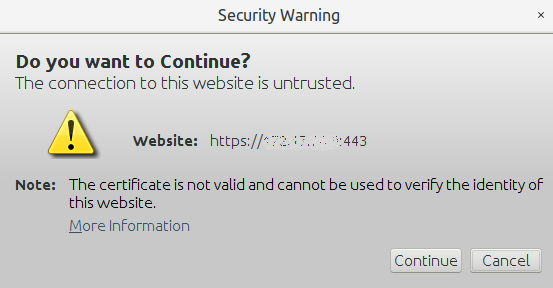 In a web browser, type 198.18.19.20 IP address, and log in using IPMI access credentials from your Welcome email. 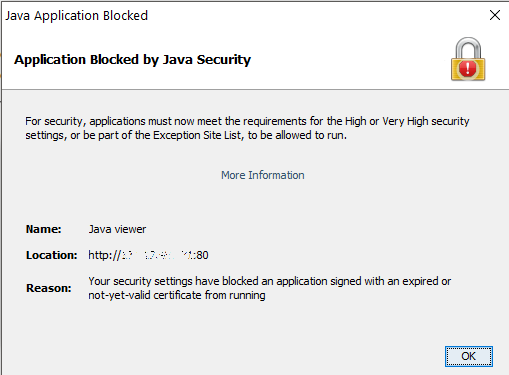 You may need to add the link to Exception Site List in Java Configuration. The Exception Site List provides users with the option of allowing applets on a site-by-site basis, therefore minimizing the risk of using more permissive settings. Open the Java Control Panel app. If the Security Level is set to Very High, reduce it to High. Click Apply. Click Edit Site List to get the dialog that will allow you to add the application's URL to the Exception Site List. In the Virtual Console window navigate to the upper menu and hit Macro >> Ctrl + Alt + Delete to reboot the server. After the installation reboots, it will come up to a boot countdown. Here, you can press any key to get to the GRUB menu. You will see a GRUB boot prompt. Press e on your keyboard to edit the first boot option. 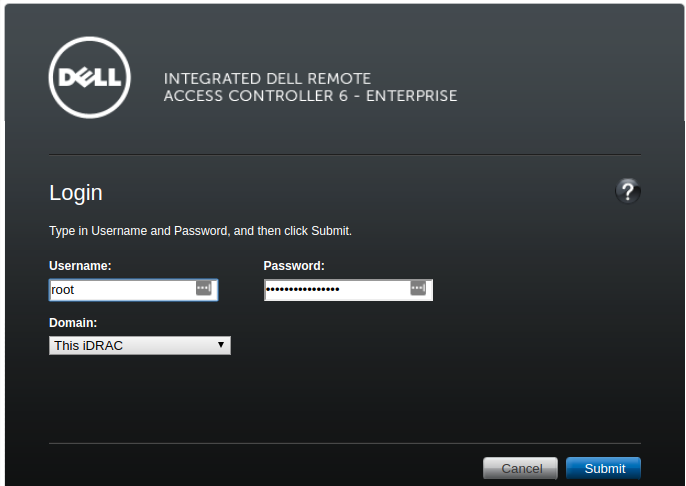 And use the passwd command typing the new password twice to set a new password. 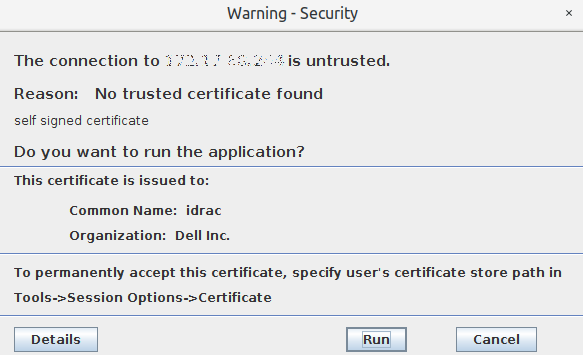 PLEASE NOTE: It is not possible to copy/paste in this window. 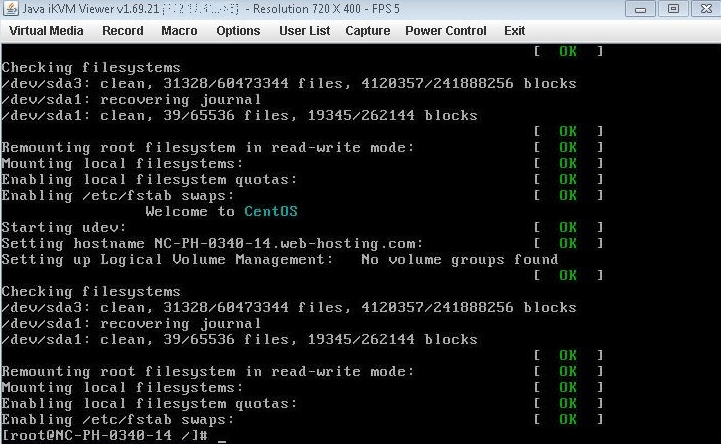 Reboot the server using the reboot -f command. 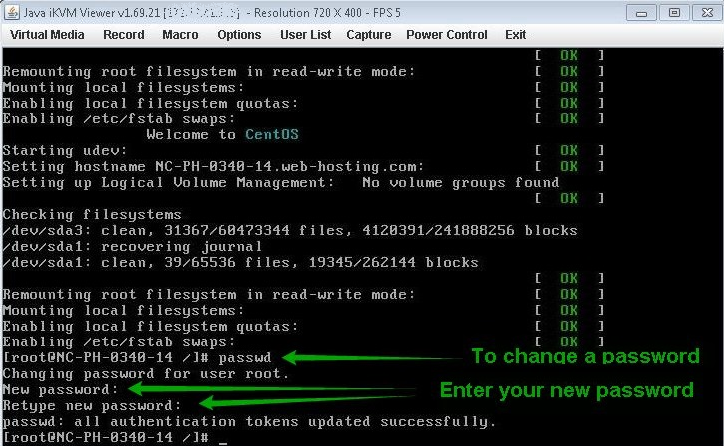 Now that you can log into the server over SSH or a control panel, you’ll be able to set up a new more secure root password. 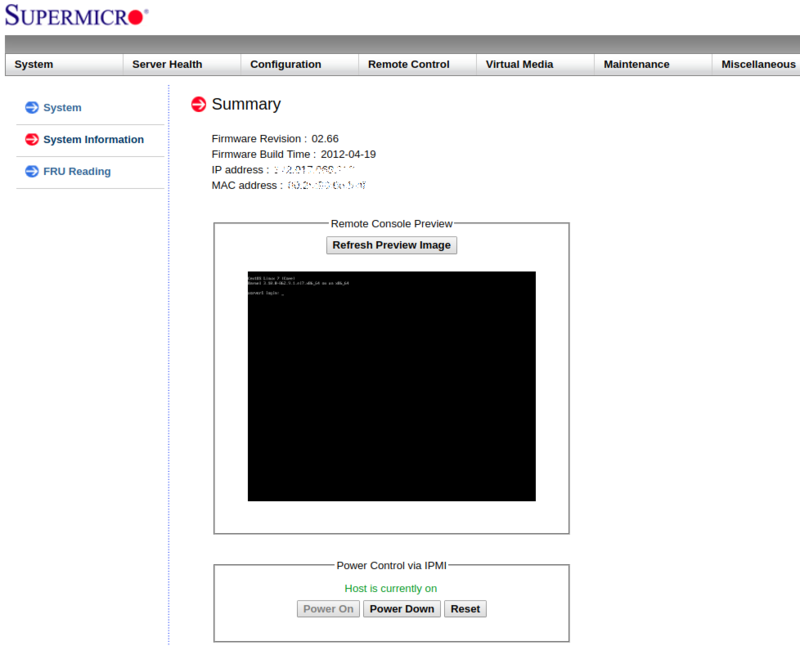 In the Java iKVM Viewer window, navigate to the upper menu and hit Macro >> Ctrl + Alt + Delete to reboot the server. After the installation reboots, it will come up to a boot countdown. Here, you can press any key to get to the GRUB menu. 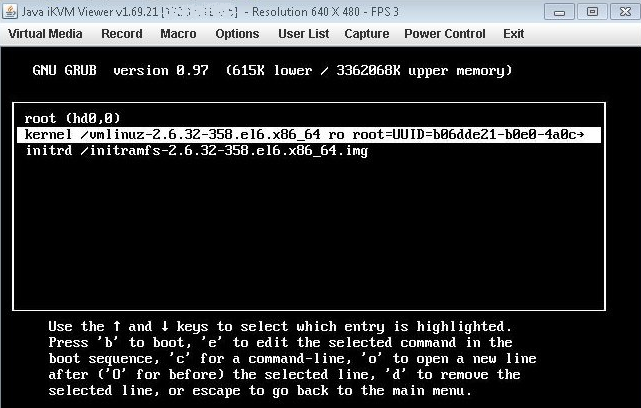 From the GRUB menu, select the appropriate kernel version and press the e key. You will now be presented with the options menu for the kernel version. 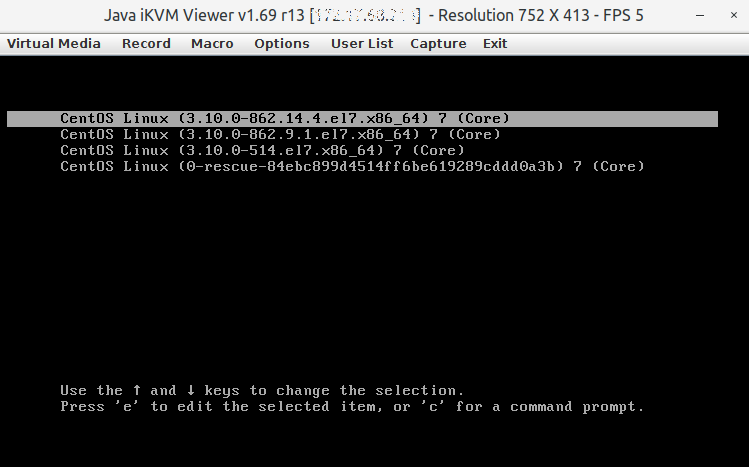 From this menu, select the line that starts with kernel /vmlinuz- and press the e key. You will be presented with the kernel boot options. Press Enter to save your changes. You will be taken back to Kernel Options Menu.